Winner of the UKs ‘Best Zombie Experience’, voted for at last year’s Scarecon, Zombie Infection has become the biggest of its kind in the industry. With the UKs very best cast and crew gathered from all corners and exclusive access to some of the UKs most unique locations, they have created something quite special for everyone. 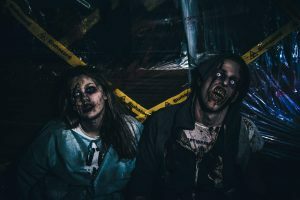 At a Zombie Infection event, you can take on the haunted abandoned Asylum in Liverpool, or the military precision required at the Factory in Sheffield. Fight alongside post-apocalyptic rebels all night at ‘The Forest’ or infiltrate ‘The Mansion’ in Nottingham. Some of Zombie Infection’s zombies have been seen lurking around Sheffield so watch out!